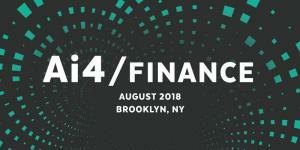 BROOKLYN, NY, UNITED STATES, June 27, 2018 /EINPresswire.com/ -- The Ai4 Finance Conference is an application-only gathering of business leaders, data practitioners, and AI pioneers who are applying artificial intelligence to solve today’s problems and create tomorrow’s opportunities. Attendees include senior leaders from top institutional banks, asset managers, insurance providers and credit card companies. Thanks to the convergence of modern computing power and data science, the financial services industry is leveraging AI to create entirely new value.